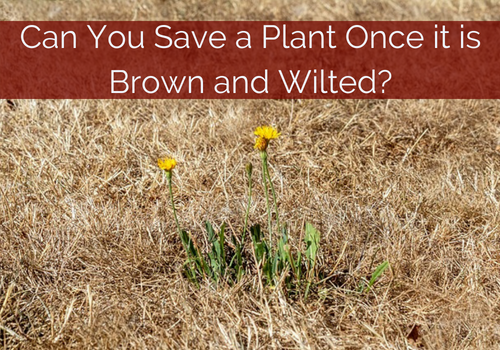 Can You Save a Plant Once it is Brown and Wilted? The hot dry summer months can sometimes damage plants causing them to become brown and wilted. This can be a real blemish on an otherwise beautiful yard. Grass, flowers, and food plants are all affected by excessive heat and lack of moisture. Fortunately, there are often ways to bring back brown and wilted plants. Brown grass can be a real eyesore in any yard. Luckily the most common cause of brown grass is draught stress or periods of excessive heat and low moisture. Brown grass doesn’t necessarily mean that your lawn is dead. At times like these, when the weather is hot and dry, grass will go dormant. When it is dormant, grass browns to conserve nutrients and water. Grass can maintain this state for 3-4 weeks before dying. To verify if your grass is dormant or not, examine your lawn at the soil level, the crown at the base of the grass should be green and the roots should be a healthy off-white color. If the entire plant (leaf, crown, and roots) is brown and brittle your lawn is most likely dead and will require reseeding – this is best done in the fall or spring. If your grass is merely dormant you can revive it by simply watering it heavily for a few days. After this you should see your lawn coming back to life! In as little as 3 – 4 weeks of regular watering your lawn can be back to its former glory. Always make sure to give your grass extra care during extreme summer heat. Drought stress is not the only cause for browning lawns. Other possible causes are disease, insects, fungus, pet spots, and improper mowing. Some of these issues can be relatively easy to solve. Eliminating pet spots, for example, is a matter of teaching your pet to relieve himself in a better location. Mowing issues are just a matter of ensuring that you mow regularly (at least once every two weeks), never cutting more than a third of the height during each mowing, and keeping the grass at a length of 2.5 – 3 inches long. Disease, fungus, and insect problems can be a bit more complicated to deal with, as solving these issues often includes treatments designed to eliminate the disease, fungus, or insects infecting your lawn. In these cases, we recommend you contact the experts at Hackmann Lawn & Landscape to properly evaluate your lawn and meet your yard’s specific needs. Grass isn’t the only plant that can suffer as a result of hot and dry weather. Flowering plants and food plants can be particularly susceptible to damage from these conditions. Not only can hot, dry weather affect the plant, but it can affect the blooms, fruits, or vegetables that it produces. If your flower or food plants are browning and/or wilting, chances are that they are not being watered properly. Both over watering and under watering can cause similar symptoms in a plant. Generally, you can tell the difference in the plant’s leaves; if the leaves are yellowed and wilted but still look moist then the issue is overwatering, if the leaves are brown, dry, and curling at the edges then the plant is under-watered. You can also check how well you’re watering your plants by sticking your finger in the soil to see if it’s moist. In either case you will want to adjust your water schedule as necessary to ensure the plant is receiving the proper amount of water. Poor lighting can also cause food and flowering plants to wilt or even brown. To ensure that your plant is receiving the proper amount of sunlight, search the yard for light obstructions. Other plants, buildings, and trees can all obstruct light from reaching plants and prevent their growth. Tomatoes, bell peppers, and cucumbers, for example, are full sun plants and require at least six hours of sunlight a day to thrive. Low light plants like kale, lettuce, and most root vegetables grow better in partially shaded areas that have less direct sunlight. If you find that you’ve planted in an area with improper lighting your best bet is to carefully replant in an area with more appropriate lighting. In addition to water and lighting, it is important to trim the leaves, branches, and stems that are brown, wilting, or dead. This will ensure that the plant is not wasting nutrients and other resources fixing damaged parts of the plant, when it could be growing new leaves, branches, and stems. If watering, lighting, or trimming aren’t the issue, then your yard may have a more complex problem such as insects, disease, or fungus. In these cases, we again recommend that you contact the experts at Hackmann Lawn & Landscape and have us evaluate your yard.